In another bout of video game news, today an update was released for Gran Turismo 6 which includes the Toyota FT-1 Vision GT. 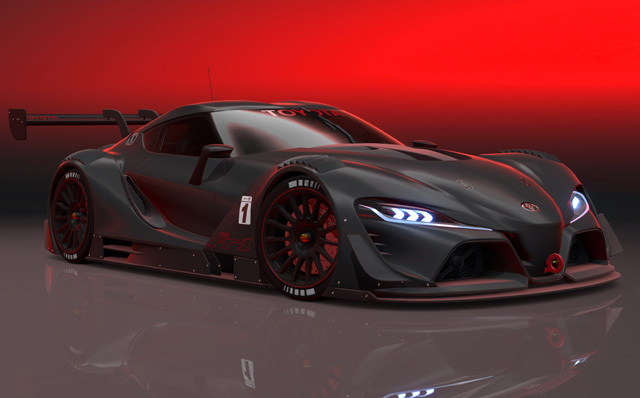 As the name suggests the Vision GT is a race version of the FT-1 Vision road car concept that Toyota built for the Gran Turismo “Vision” project. “Vision” cars (for now) can only be driven in the pristine virtual world that is Gran Turismo, so if you’ve ever wanted to know what its like to get behind the wheel of a pure-bred motorsport version of an already outrageous car then fire up the ol’ PS3 and download the update, its totally free! ← Gaming Hype: Forza Horizon 2 Demo Out Today On Xbox Live. Launch Pack DLC, VIP Membership Benefits, Car Pass Announced.